Join us for an afternoon of fun, food and relaxation! Do you like going to wineries and trying new wines? Are you tired of the same old Chardonnay, Merlot and Cabernet Sauvignon on the menu? Would you like to try some new varietals and maybe learn something new…or expand your tastes? Are you curious about single-malt scotch whiskies, but are afraid to pay a significant amount of money at a restaurant for a glass you know nothing about, or invest in a whole bottle of scotch at your local store that you might not like? Would you like to experience something new? We have an event for you! Join us as we socialize…and eat…and sip…and watch the sunset over the harbor! We’ll be serving an elegant casual dinner on the patio where you’ll have the opportunity to sip some unusual wines and/or taste some single-malt scotch whiskies. It’s time to ditch the same ol’ wine you’ve been drinking and expand your palate. For our tasting party, you won’t find any Chardonnay, Merlot or Cabernet Sauvignon being served. No more of that bottom-shelf TJ’s select or that bottle of Apothic [really, it’s Gallo] Red. Why? 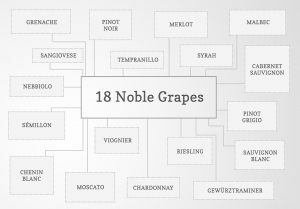 Well, because not only will you get to try some of the 18 noble grapes, but by doing so you’ll be open to new wines to enjoy with that roast chicken, that favorite pasta dish you love, that perfect steak…or that dessert you’re serving at the next family party. Challenge yourself to try some of these “new” varietals. And in case you’re afraid that you might not find something that you like, during dinner we’ll be serving your reliable Chardonnay, Merlot and Cabernet Sauvignon. 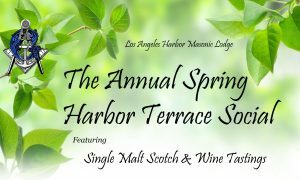 We’ll also be sampling some single malt scotch whiskies. So what is single malt scotch? Why do aficionados turn their noses up at “blended” scotches? For many years, Scotland has produced some of the finest whiskies the world has ever seen. Smoky, peaty, smooth… no country in the world does whisky like Scotland. This fantastic brown liquor has a distinctive flavor keeps one coming back for more. Whisky is wonderful stuff and well worth investigating, so if you’re not yet moved by the category and prefer a vodka and soda, it’s time to give it a go. And fortunately, for you, in the world of single malt whisky, beginners are a welcome bunch. Keen, yet not demonstrating any of that gauche geekery; rarely blinded by hype; and stripped of the overbearing adjectives that thwart the satisfaction of a simple sip. Tickets $25 per person in advance | $30 at the door.